Did we really walk 46 kilometers in a day? Of course not. This was the Day of The Shortcut. When Eric and I walked our first Camino, we were purists. The familiar mantra “Walk your own Camino” meant that it was meant to be walked, and I confess I felt plenty of self-righteousness when we’d meet other pilgrims who skipped “the boring parts” by bus or train. But now, on the Norte, we faced a dilemma. Eric and I had a limited vacation (by our standards), with only 17 days on the trail before we had to turn around and go back to the US. We were walking relatively short distances most days, not always hitting the official stages of the Village to Village Guide. 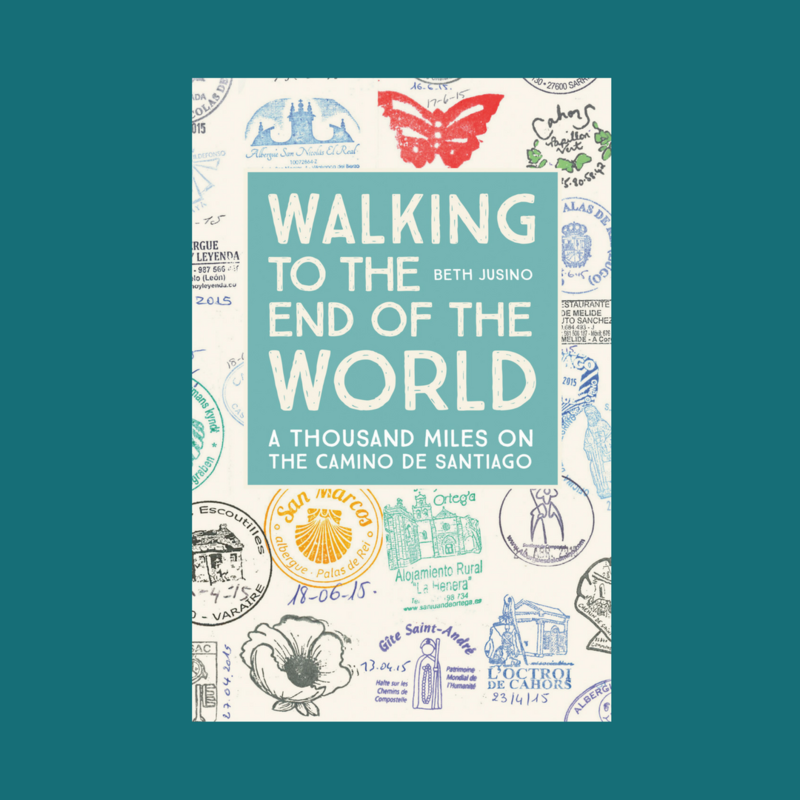 We were never going to get to Santiago, I knew, but I wanted to at least get as far as Llanes, to soak in what the book called “the best views of the whole Camino route.” But to do that, compromises to our purity would have to be made. In Larrebetzu, where our last episode ended, we were on the outskirts of Bilbao. 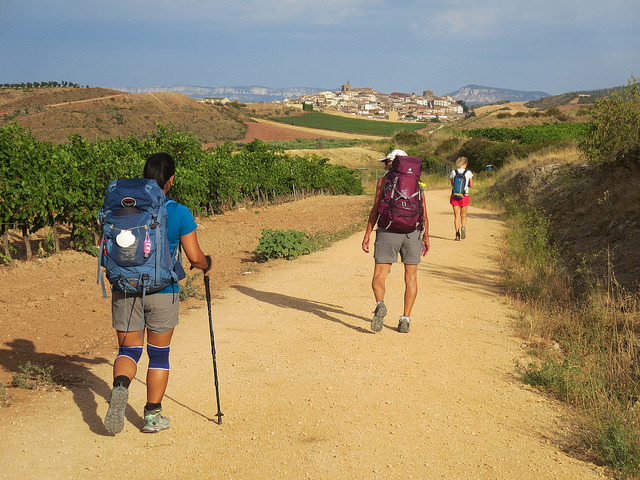 The next 30 kilometers of Camino trail would be urban, and Radio Camino reported that it was an uninspiring walk. The old city of Bilbao was beautiful, with a cathedral and the twisting streets of the Old City, but was that worth a whole extra day? Eric and I debated, discussed, consulted Google, and decided no. According to Google Maps (a great app for navigating public transportation in Spain, by the way), there was another way. A bus would stop practically just outside our albergue door at 9:00 the next morning, and in just 40 minutes carry us around Bilbao entirely, cutting 30 kilometers of pavement walking. From there, we could still stretch our legs with 16 kilometers on foot to Pobeña, a small coastal town that seemed interesting. Peter and Michele, the yin and yang of our Camino family, watch the world blur by. Buses are incredibly fast when you’re used to traveling by foot. Word of our plan spread through the albergue, and the next morning there were six of us at the bus stop: me, Eric, Peter the Australian, Michele the smiling French/Spanish linguist, and the two women we called The Giggling Germans. Navigating public transportation in a foreign country always makes me a little nervous. Will I know where to go? How to pay? When to stop? But everything went exactly as planned. The bus came, collected our fares of just over 1€ each, and carried us to the end of the line. There was even a bonus: the bus let us off on the east side of the Nervion River, at the foot of the city’s great Vizcaya Bridge. This ingenious “transporter” is a designated UNESCO World Heritage site, first built in 1893 to ferry people and vehicles across the mouth of the busy river without impeding the busy commercial water traffic. Our group of six walked onto a small gondola-like carriage hanging from cables far above the water. Instead of going up and over the river, for € .40 (a whopping 46 cents US) we glided across it. I suspect it was more fun than anything we might have seen in those 30 kilometers. Did our shortcut make us lesser pilgrims than those who followed every yellow arrow? Perhaps. Were we even pilgrims at all if we weren’t going to Santiago? Maybe not. Did it matter? Not at all. Every person, I was finally learning, approaches the yellow arrows for their own reasons and with their own priorities. From Portugalete, we wound our way through plenty of urban streets (with moving sidewalks!) and then through the industrial tunnels and concrete overpasses of urban sprawl. The walk was smooth but uninspiring until we hit Playa de Arena and, finally, returned to the beaches and ocean. Pobeña was just a kilometer or so inland, along a river inlet of tidal water. The municipal albergue in town was crowded but serviceable, and in the plaza just beyond it was a string of local cafes and bars. A group of older Basque men, most of them wearing black berets, went from bar to bar, singing classical folk tunes to draw the tourists (while having their cups filled for free in return). This, I decided, was the ideal way to enjoy retirement – surrounded by friends, music, and a few free drinks. The afternoon passed peacefully, as we all soaked in the sun and watched the tide. Just before dinner, Michele – a man with the joyful heart of a child and the generosity of a much older man – convinced a group of us to go back to the beach. We’d been walking along it, observing it, for days, but he made us realize that none of us had actually dipped our feet in the water. And so we did. Three Germans (we added one somewhere in the afternoon), one Australian, one Spaniard, one Frenchman (Olivier from Paris had arrived that afternoon, after walking through Bilbao), and two Americans all flowed toward the ocean, just as the sun was casting its warm rays of evening. We rolled up our pants, shed our shoes, and…the only word I have is that we frolicked in the waves. We laughed. Splashed. Played like children. A week before, we’d never met. A week later, we would be scattered back to the far corners of the globe. But there in Pobeña, the sunset and the ocean were ours. As a former Bilbao resident, I have to say I feel sad you missed the city…but I agree, it is a horrible, horrible walk. It would be worth a visit just to see the city if you’ve never been. If you have…well you made the right choice 😉 I think I actually biked to a place on the edge of town as I walked all over the city living there. This entry makes me homesick! I have heard quite a few people tell me each successive camino teaches us to surrender our rules and allow it to be what it is, it helps us accept all those others who for whatever reason are ‘cheating’ or we would have once viewed as cheating. They are all just doing the best with what they can do. Love the post.